Turkish Angoras are most well-known for their long, silky fur coats. While white is the standard color, additional colors are being introduced into the breed. Today, Turkish Angoras can be found in white, black, orange, lavender, chocolate and more. This breed of cat is relatively small in size though their bodies are long. They feature large, almond-shaped eyes with large, pointed ears. These cats are known to be among the most dainty and graceful of all breeds. Turkish Angora fanciers are as attached to their cats as their cats are to them. Angoras seem to invoke strong responses in their humans with their symmetry, intelligence, and devotion to their humans. Angoras bond with their owners completely; an Angora is not happy unless it is right in the middle of whatever you?re doing. They enjoy a good conversation and can keep up their end of the discussion with the best of them. Angoras are good-natured, but determined. Once an Angora gets an idea into its head, you might as well just give in and spare yourself the lengthy argument. 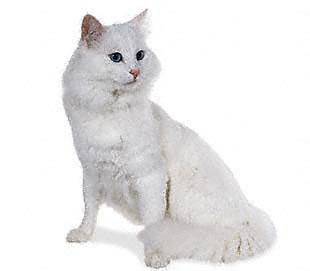 While it is a long-haired breed, the Turkish Angora does not require significant grooming. Thanks to their origins in the cold mountains of Turkey, they have developed a thin, luxurious fur that rarely becomes entangled. This does not mean that no grooming is required. A thorough brushing to remove loose hair is usually all that is necessary, however some Turkish Angoras may demand a bath.